A golf tournament promotional accessories item that every recipient on the course will utilize, the Birdie Pack. The 8 piece birdie pack contains 6 extra tall 3 1/4" wood golf tees, 1 plastic ball marker and divot tool. Don't be fooled by cheap accessory packs. The 8 Pc. Birdie Pack contains Extra Tall Golf Tees. Pair this inexpensive item with our Deluxe White Golf Towels for golf tournament promotion. Individually poly bagged for ease of distribution and promotional presentation. Delivery from date of order for this promotional item is 3 weeks. 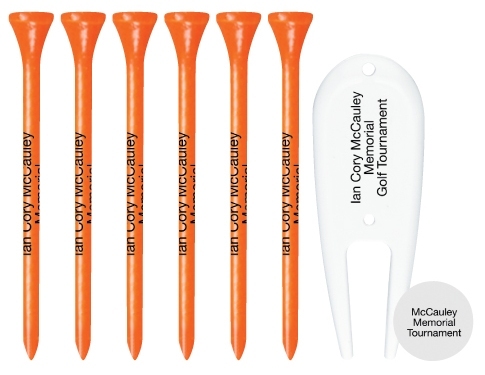 GOLF TEES: The price includes a one standard color imprint in an area 1 1/2" W x 7/16" H.
DIVOT TOOL: The price includes a one standard color imprint in an area 1" W x 5/8" H.
BALL MARKER: The price includes a one standard color imprint in an area 1/2" dia. Factory screen charge is $50.00 total for all three items, one color imprint only. We will set type for your advertising in a stock font at no additional charge. Birdie Packs have a maximum of a one same color imprint per item.